Medical assisting in New York is an in-demand profession, with over 1,000 new jobs being added every year from 2012 to 2022. Medical assistants can choose to work in the front office, where they work with such necessities as scheduling or billing, or they might work the back office, which puts them in direct patient contact by taking vital signs or collecting laboratory specimens. Medical assisting schools and programs in New York prepare students to take their certification exams and handle roles in both parts of the medical office. Discover what students can expect during their education and training and after graduation when they start earning a paycheck. A career as a medical assistant begins with a certificate or degree from a quality college, with graduates going on to enter the workforce or continue on with their education. Medical assistants work hand-in-hand with physicians and other medical staff to take care of patients and endure all medical records are in order. To find a program that offers quality instruction, small class sizes and reasonable tuition rates, you need to do your homework. We've done the research for you by analyzing schools in New York based on our criteria. 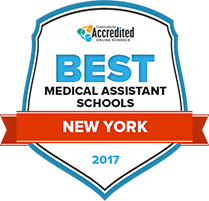 Check out the top-ranking schools with medical assisting programs in New York below. The first two semesters of the medical assisting certificate curriculum at Mohawk Valley Community College delve into topics such as medical terminology, allied health pharmacology, computers and health care law and regulations. The last semester of the program generally takes place during the summer. Locations where students complete the four credit externship include locally approved clinics and doctor's offices. Completion of the externship does not occur until students log at least 180 hours at an approved healthcare facility. Office management is the other final course that generally takes place during the summer semester. This course covers functions like medical transcription, business communication and medical reporting. Bramson ORT College's Associate of Applied Science in Medical Assisting degree provides adults with the education to fulfill needs associated with growing supportive healthcare careers. In addition to entering careers as medical assistants, program graduates could enter phlebotomy assistant, laboratory assistant and medical coder careers. Applications and admissions into the program operate on a rolling semester basis. Classes that make up the 63 credit curriculum cover real life medical assisting functions such as medical billing and coding, laboratory procedures, medical ethics and law, pharmacology and medical office risk management. Genesee Community College primarily serves adults continuing their education in the Batavia, New York area. The college's medical assisting program requires students to complete at least 140 contact or classroom hours to graduate from. Although the 160 hour externship is optional, the externship is an effective way to experience what it is like to work in an ambulatory healthcare setting in real time. Outcomes of the program include preparing students to successfully prepare patients for exams and medical procedures. Other program outcomes include teaching students how to perform basic laboratory procedures, diagnostic testing and take patient vital signs. Medical assistants fulfill support functions at private and public healthcare facilities. Specific places where medical assistants work include private doctor's offices, emergency clinics, hospitals and long term care facilities. Depending on the employer, medical assistants may require formal training before they start working with patients. Training within SUNY Sullivan's Associate in Applied Science in Medical Assisting degree teaches students about office and laboratory procedures and functions like immunology testing, blood donor techniques, urinalysis and measuring and recording patient vital signs. The full curriculum requires students to take core courses, general education and liberal arts electives. Composition is among the required general education classes. The Associate in Applied Science in Medical Assisting degree at Niagara County Community College is part of the school's nursing and allied health department. Aim of the program is to prepare adults to meet the demands of the multi-faceted medical assistant role. To achieve this, instructors provide students classroom and laboratory training at basic and more advanced levels. Medical terminology, basic laboratory procedures, human anatomy and blood donor techniques are types of topics that students gain training on. The test of how well students absorb classroom training occurs during the 160 practicum which takes place at the end of the program. Aim of the SUNY Broome Community College Associate of Applied Science in Medical Assisting degree is to prepare adults with a passion to help others to succeed while working in the diverse medical assisting career field. Medical terminology, medical office management, urinalysis, human anatomy and basic clinical procedures are types of techniques and knowledge that graduates should obtain. Classroom instruction and lectures are strengthened with a 14 week externship. The externship takes place off campus at approved local ambulatory healthcare facilities. Combination of the training equips students to sit for the medical assisting certification exam. New York is home to several medical assisting schools. How can a student choose the right one from among several worthy programs? This search tool can help aspiring students narrow down the options by choosing the criteria that is most important to them. How does New York define the job of medical assistant? Of course this is not an exhaustive list. Medical assistants in New York must be supervised at all times by their supervising physician. Technically, no - certification is not required. However, many employers prefer it, as certification proves a basic level of knowledge and skills that are vitally necessary in order for a medical assistant to perform their job well. Those who choose to obtain certification might have an advantage among a field of otherwise qualified applicants. The following certifications are recognized across the nation, including by employers in New York. New York does not require formal education to become a medical assistant. However, medical assistants who prefer to earn certification must graduate from a medical assisting program in order to sit for the examination. There are numerous schools in New York that offer medical assisting programs, culminating in either a certificate or an associate degree. Are there tasks outside the scope of medical assistants in New York? Medical assistants in New York see a median annual wage that is higher than wages for medical assistants across the rest of the nation. The following chart offers further comparison. Medical assistants in the state of New York might see varying salaries, depending upon the geographical area. For instance, those who work in the Buffalo area might make more than those who work in the Binghamton area, or those who work in the Suffolk metro area might see higher pay than those who work in Ithaca. Below is a breakdown of annual medians and hourly wages, depending upon the specific area. Employment of medical assistants in New York is expected to grow quite rapidly at over 26 percent, with over 1,000 new jobs added each year. The following table goes into more detail on employment trends from 2012 to 2022. There are several schools in New York that offer accredited programs in medical assisting. Some of these programs offer either certificate or associate programs, while some schools offer both. In addition to providing a curriculum that will prepare students to work as medical assistants and receive their Certified Medical Assistant certification, Erie Community College also has a significant portion of the curriculum devoted to liberal arts courses to provide a well-rounded degree. The associate of applied science degree in medical assisting requires 63 credits and takes two years to finish. The center offers both day and night classes to meet the scheduling needs of students. Once the medical assisting program is completed, graduates will automatically become eligible for entry into other programs. The Center for Allied Health Education offers a certificate program for those wishing to become a medical assistant. The certificate program fully prepares students to sit for the Certified Medical Assistant exam. The guidelines specifically outlining tasks medical assistants in New York can and cannot do. The New York State Society of Medical Assistants works to help the professional development of New York state medical assistants through career resources, networking events and providing medical assistant relevant news.